A nautical themed shopping centre extension is set to reinvigorate Eastbourne town centre. Martin Cooper reports. 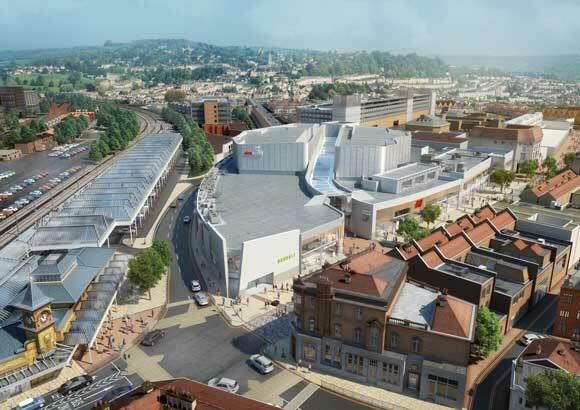 Steel tonnage: 2,000tA new name, new shops, new restaurants and a new cinema, it is all change for Eastbourne town centre’s leading shopping destination. An £85M extension to the existing Arndale shopping mall is currently under construction and it will provide 22 new retail units, seven restaurants and an eight-screen cinema. Once complete, the new enlarged centre will be renamed The Beacon, a name that conjures up images of the town’s coastal history and the nearby Beachy Head Lighthouse. Andrew Rice, Fund Manager for the centre owners Legal & General says it is never easy to find a new name for a shopping centre with a 38-year history. According to tp Bennett Project Architect Julie Heron, the nautical idea from the name has been carried over into the design of the extension. Aside from these unique design features, the entire 16,200m² extension is being constructed as a steel frame, which is partially divided in two by a covered L-shaped pedestrianised street. Officially described as an outdoor space, the street will however offer some weather protection as it will be topped with a glazed undulating roof, supported by the main steel frame. Cutting across the site, approximately at the point where the L-shaped street cranks, a movement joint splits the steel frame into two separate parts via a row of double columns. “The client wanted the flexibility so that tenants could knock down partition walls in the future if stores needed to be enlarged, and so this meant cross bracing could not be located within internal walls. Overall the extension consists of two lower levels, with retail units located at ground floor and restaurants accommodated at first floor. Towards the centre of the extension there are two further upper floors, a second floor housing the cinema’s eight screens, and a third floor accommodating the projection rooms. The cinema levels straddle the street, with two second floor footbridges spanning the pedestrian thoroughfare. The project’s two anchor stores, Next and H&M, differ from the other retail units as they have two trading floors with their upper levels accessed via internal staircases and elevators. “Designing a retail mall with a cinema above means there is very little repetition within the frame’s structural grid, as many of the retail units and all of the cinema screens are different sizes,” says Mr Christie. With numerous locations having column grid changes, the project has a fair amount of large plate girders acting as transfer structures. One notable area that needed transfer structures is a suspended service yard, built above some ground floor retail units. In order to support the yard and take into account the loadings that delivery trucks will exert on this slab, a series of large transfer girders has been installed. Value engineering plays an important role in most projects’ design and this scheme is no exception. Having initially been designed by project consultants Clarke Bond, Caunton were employed to take on the project at RIBA Stage 4. “We increased the profile and gauge of the metal decking to allow it to span further, which then meant we required fewer beams to support it. The beams we did install were larger members but, even with a slightly higher steel tonnage, the project saved money as the fire protection requirement was reduced,” explains Caunton’s Engineering Manager Matthew Shimwell. Planning and logistics have also played an important role on this scheme as the development is taking place adjacent to a ‘live’ shopping centre and in the middle of the busy town. Along one elevation, which will eventually accommodate the link between the old shopping centre and the extension, the new build abuts the old with columns only 100mm apart. New foundations could not be installed close to the existing centre and so one grid line of new columns is supported on cantilevering footings. 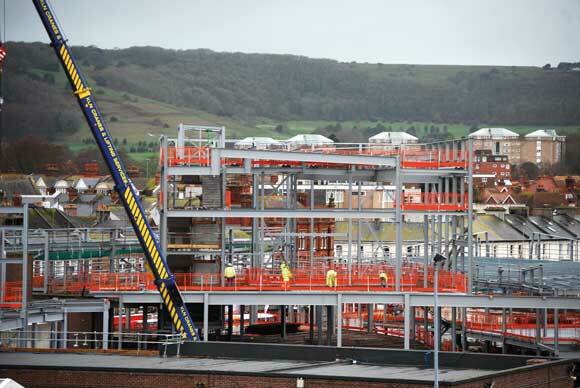 Summing up, Kier Senior Project Manager Alan Quigley says: “Ordinarily we would have erected the steel frame and built our way out of the site from the service yard and then finished up nearest the site entrance. As well as constructing the shopping centre’s extension, Kier is also undertaking a number of other phases of work for this scheme. Initially the company built a new west entrance to the mall and completed the remodelling and refurbishment of the management suite. In addition, it has also recently commenced the remodelling of the east entrance, which is said to be particularly challenging as it remains open to the public throughout the works. However, possibility the most challenging part of its work consists of enlarging the mall’s existing multi-storey car park. Although this work is being done only a stone’s throw from the extension, it is a separate site with its own access and delivery points. The original six-storey concrete-framed car park is having two extra levels added to its top. In order to minimise the weight on the existing foundations, a steel-framed solution supporting metal decking is being used. All of the 90-plus existing concrete columns have been strengthened to allow the new steel columns to be landed on top to form a replica grid pattern for the new upper floors. Working on behalf of Caunton Engineering, Composite Profiles has been engaged to detail, supply and install over 9,000m² of composite metal floor decking for the new floors. Composite Profiles Senior Operations Manager Mark Harley says: “Tata Steel’s ComFlor 80 profile was the obvious choice with its long-spanning capability. The profile is also available with Tata Steel’s unique Colorcoat FD170 pre-finished coating to the underside.